On September 30, Sunday, Princess Charlene of Monaco attended the fashion show of Swiss fashion house Akris, held as part of Paris Fashion Week. Princess Charlene watched Akris's Womenswear Spring/Summer 2019 podium show. 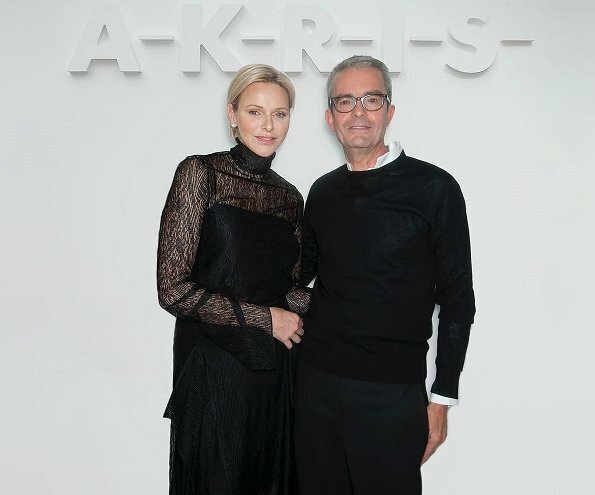 Princess Charlene wore a dress from Womenswear Fall Winter 2018-2019 collection of Akris. superbe Charlène et très à l'aise je l'adore. I love her hair and make-up, but not the dress. I hate this one. I am distracted by the thin straps of her top showing, the very long and strange sleeves are totally unneccessary, and I find the high and tight neck unfortunate. The skirt is a real desaster. It pulls at her waist, only to then hang lose with a lot of excess fabric further down. Looks like a butchered curtain. Also, this almost gothic look does nothing for Charlene, nor do I see how it would be appropriate for any of her public appearances. And on top of it all, her shoes are ugly plus seem very uncomfortable. LOL, but I think you’re spot on. Love her hair and makeup though. My sentiments exactly. Hair is (I suppose) getting better. And indeed, this isn’t her worst makeup (there were some horror stories before). So, in the spirit of looking for the upside, I am with you, Southernbelle. Not one I like a lot, but Charlene looks good in it. I think this one is not much an elegant dress. I don't love the dress but she can carry it off. She really can wear black well without looking like she's going to a funeral - probably thanks to the contrast with her blonde hair. Ok I officially hate this trend of skirts that have a sheer overlay extending lower than the hem of the underskirt. It looks awful, like a sheer party dress over a slip that is way too short because the wearer couldn't bother to get one that is the correct length. But you know what, I'm guessing that few young women even own a good old-fashioned slip these days -- so how would they know?! Sigh. She did well swapping out the lining for all black. I like this dress, and it is perfect for an event such as this. Charlene is a blonde that can wear black without getting too washed out.